If you've been following me on IG this week, you've seen that I've been sew, sew, sewing all week (pics on the blog tomorrow). This is NOT a typical week for me. I'm a busy mom of two small children who squeezes in sewing whenever I can. I want to share a few of my quilting tips with you. Keep your machine in a common area. Now, don't get me wrong. I drool over the lovely sewing rooms that I see on blogs and IG, but that is not how I roll. I have a small table for my machine in the corner of my living room. When I started sewing in the living room I had two kids under age 3 and hiding up in the upstairs office never would have worked to get any sewing done. Having my machine in the living room (next to the kids art table) allows me to hear them playing downstairs while I sew. In the beginning it meant I could sneak in a few minutes of sewing when they planted themselves at the art table. Now that they play more independently, I still like to be close enough to monitor them while I sew. Also, after I'm done eating breakfast or lunch with them and they are still eating (they can be SO slow! ), I can hop over to the sewing machine and still keep an eye on them eating. I can see that in some number of years this may change for me, but for now it's the most productive corner of the house my sewing machine could possibly be in. Work on two (or more!) projects at a time. This might sound crazy, but hear me out... I piece nearly everything using a medium grey thread (aurifil #2605) which allows me to work on multiple projects simultaneously (time saver!). Working on multiple projects allows me to chain piece, going back and forth between projects, hardly ever lifting the presser foot. I prep two piles to chain piece, one group from Project A and one group from Project B, then I start chain piecing. Once I get all the way through the Project A group and into the Project B group (so what's under the presser foot is Project B), I pause sewing (don't lift the presser foot) and snip the thread between the last Project A seam and the first Project B seam. Then I take the Project A group to the ironing board to press my seams, snip the sections apart, and use those units to make my next pile of Project A pairs of fabrics to be pieced. Once I get done sewing the first batch of Project B seams, I repeat the process. I just flip back and forth between the projects until I'm done with one or both. Stay organized. Since I like to work on multiple projects at a time, staying organized is key. One thing I love for this is fast food trays. (see above, available on Amazon) I first ordered a dozen fast food trays for using for kids projects. They are great at the art table for keeping messy projects more contained. They're terrific for holding loose lego pieces while building. Then I started borrowing them for my sewing. (Now I have my own set.) I put the pieces for each project (or each section for a larger project) on its own tray. This allows me to shuffle them around as needed, but to keep pieces together with the proper project/section. 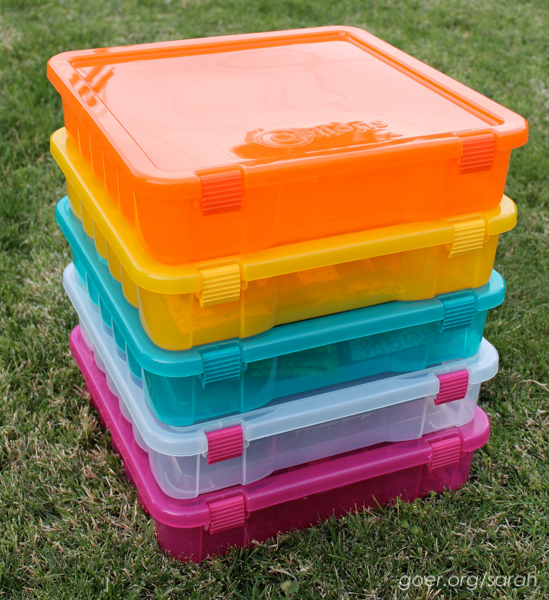 For storage, I also employ individual project bins for each project. I'm a many (very many!) WIP kind of girl, so I own quite a few of these craft bins (Creative Options, sometimes available at Costco). 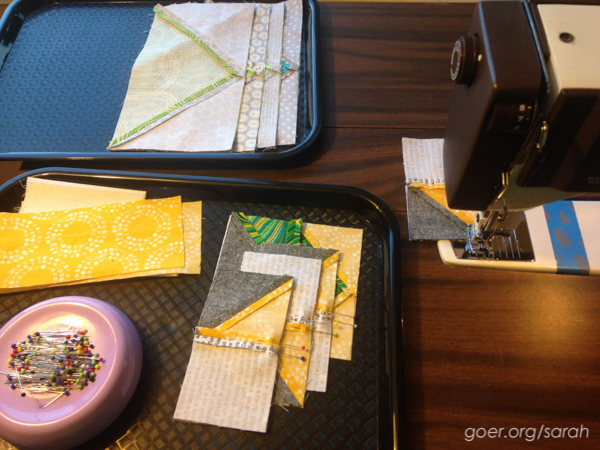 Sarah lives in San Jose, California and started blogging and more actively quilting at the beginning of 2014. She loves bold, saturated color and geometric patterns. Sarah is currently trying to finish up old WIPs while also participating in multiple mini quilt swaps and quilting bees. You can follow her on Instagram @sarahmgoer or on her blog Sarah Goer Quilts. Great tips Sarah! I always love reading what other people do to help facilitate their creativity! How to do it all!